An organic Mott-insulator κ-(BEDT-TTF)2Cu[N(CN)2] Cl(κ-Cl) on SiO2/Si substrate showed an ambipolar field-effect-transistor (FET) characteristics without any hysteresis, which means a continuous Mott-transition at filling-controlled regime (BEDT-TTF = bis(ethylenedithio)tetrathiafulvalene). In order to extract the critical exponent in the vicinity of the Mott-insulating phase, an analysis based on Efros-Shklovskii approximation is performed. The model fitting well reproduces the device characteristics over wide range of temperature and gate voltage. 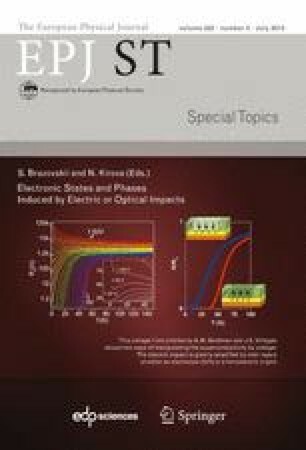 In this analysis, Coulomb gap temperature that characterizes the ground state of doped Mott-insulator shows inversely proportional critical behavior against the doping concentration.